In two days, my 20th year of teaching will be done. It is hard to believe that 20 years ago I was just graduating college and had been hired into my new teaching position....a 4/5 split on B track, whatever that meant. Little did I know that my first class would shape who I am as a teacher today. You see, what I learned from that class was that teaching was going to be work for me. 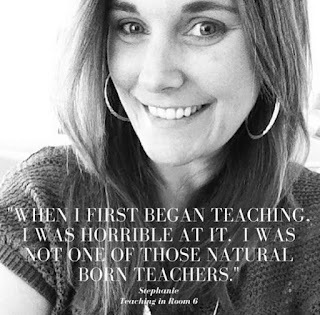 When I first started teaching, I was horrible at it. I was not one of those natural born teachers. I thought I would walk into the classroom, the kids would listen, and the world would be changed. It didn’t quite work out like that. It took the intervention of our school coordinator to put me on the right track. She taught me the “tricks of the trade” and helped set me on the path to the teacher I am today. She showed me how to manage my class and how to inspire the students through innovative and thoughtful lessons. She taught me that the classroom should reflect the students and their learning. Because of this, I ONLY decorate my classroom with students’ work. Everything that goes onto the walls (unless mandated by my district) has been produced by my kids. That woman, through her selfless acts to help me, enabled me to find my footing as a teacher and instilled in me this love of educating children through high expectations that I keep with me each time I walk into my classroom. And after 20 years, when I walk into my classroom each morning, it feels like my second home. I have spent so much time there, that everything is just comfortable. To make things comfortable, I have carefully curated it over years and years of begging, borrowing, and buying. While the buying in bulk may have slowed down, I am still always on the lookout for a deal and love when Scholastic has their books on sale for $1. I know all the stores that give teacher discounts and frequent the Dollar Spot at Target. I repurpose like nobody's business. All of this has helped to create a speech I want be in for years of my life. Now that I have been teaching for 20 years, I have seen this profession change more times that I can count, but I also know that with each change comes a chance to try something new and expand my bag of tricks. I scour blogs and IG and FB and Pinterest and try new things in my room constantly. I looks at trends and take what I know will work, try out things that I am not sure about, and leave the ideas that are really just a flash in the pan. But even with all of the experimentation and risk-taking, I still have some great tired and true lessons that I know will be a hit with any and all classes. I keep those at my disposal and am able to adapt them to the ever-changing needs of my students. My experience has served me well. And now, as I move into the 3rd decade of my teaching career (did I just say that out loud??? ), I know that I must keep up the momentum I have built. I will keep moving forward, learning, and growing. My students will need to stay at the forefront of my thoughts as I adapt to an ever-changing environment in this world we call teaching. Things will keep moving. Things will keep changing. And with a lot of work and luck, I will do just fine. 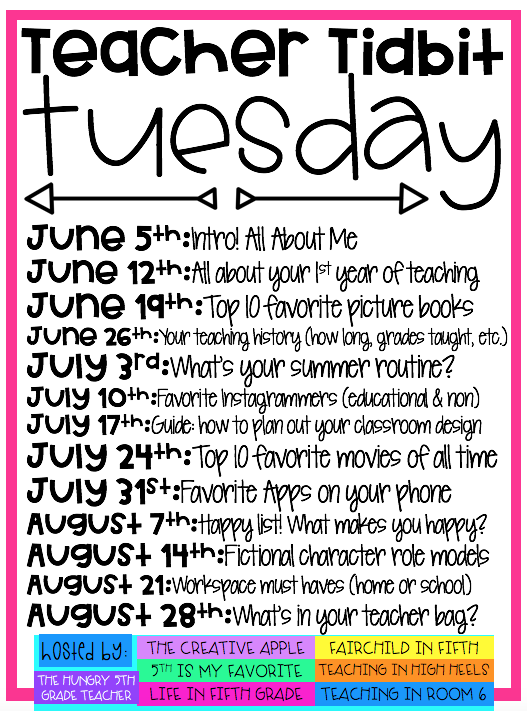 This summer, I am joining with some amazing bloggers to bring you tips and tricks for your classroom. Today, we are all introducing ourselves. So now that you know a bit about me, please visit my friends below to learn about them. 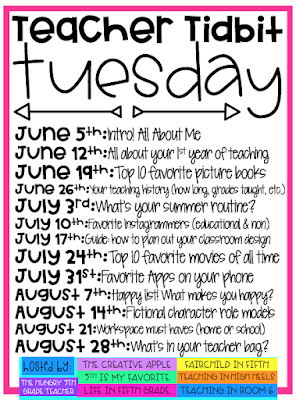 Then come back every Tuesday to learn a bit more that you can bring back to your classroom.